Tibet is a region in Central Asia inhabited mainly by the Tibetan people. The majority of its population speak the Tibetan language and profess Tibetan Buddhism. Since the 14th century, Tibet has been ruled by the Dalai Lama, a spiritual and political leader. 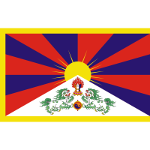 In 1950–1951, the territory of Tibet was occupied by the People's Republic of China. Chinese authorities began secularization of the Tibetan society and launched socialist reforms. Popular discontent with the government's policies led to a revolt that erupted in Lhasa on March 10, 1959. The Tibetan uprising was violently suppressed. Dalai Lama had to flee into exile. He established the Central Tibetan Administration that is often referred to as the Tibetan government in exile. The failure of the uprising resulted in a crackdown on independence movements. The anniversary of the uprising is observed by Tibetan independence groups such as Students for a Free Tibet. The Dalai Lama typically releases an official statement on the occasion. On March 10. political demonstrations and protests are often organized.